Use concealer to make your eye prepared—concealer is very useful for covering dark undereye circles. Under each eye, from the inner corner, then the pupil and the outer edge, apply one dot of concealer respectively. Then, use your ring finger to pad lightly, not rub, till it been absorbed. Cover your lid with eye base—this step is very important for your eyeshadow to stay in place. So, you need to cover your lid with eye base to guard your eyeshadow against being a greasy line. Apply Eyeliner— both pencil eyeliner and liquid Eyeliner are OK. Of course, you can also use dark eyeshadows instead (dip a wet slanted in a dark eyeshadow, you can got the same effect as eyeliners). Close your eye, and start with your upper lashes from the inner corner to the outer corner. Then, line your bottom eyes from the middle outward. To make the line natural, use your finger or a Q-tip to smudge the bottom line. You’ll get a smokey eye if you brush your lid with a dark eyeshadow. Follow with eyeshadow–Usually, you can blend three different colors but make sure to mix them well. Use the lightest color as the base and brush it to the entire eye (across your lid, then up to your browbone), then draw the middle color. The darkest color should be applied lastly. You should do all these with a light hand. Pop your eyes with a highlighter—just put a bit of the lightest eyeshadow in the inside part of your eye where the upper lid meets the bottom lid, your eyes may be totally brightened. 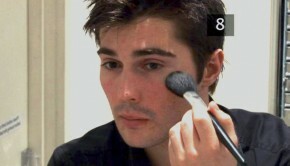 Then, dab the same light eyeshadow on your browbone from the middle outward to highlight your brow. Curl your eyelashes— Curl your eyelashes can make them looks longer and make your eyes look bigger. End with mascara— Wiggle the wand back and forth from the base of lashes upward for several sweeps. Do the same procedure for both upper and bottom lashes.